Mankato Family Homes has the experience and knowledge to handle all of your residential home improvement and building needs, including remodeling and new construction. Mankato Family Homes delivers attention to detail, craftsmanship and quality to every project, whether it's a small update or a complete design/build project. 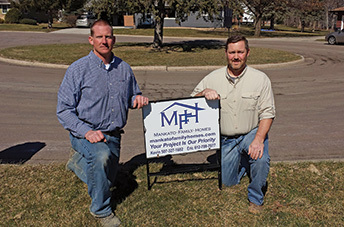 Mankato Family Homes is an LLC partnership owned by Kevin Simmons and Eric Van Eps. In addition to being business partners, Kevin and Eric are also brothers-in-law, which really puts the "Family" in Mankato Family Homes.